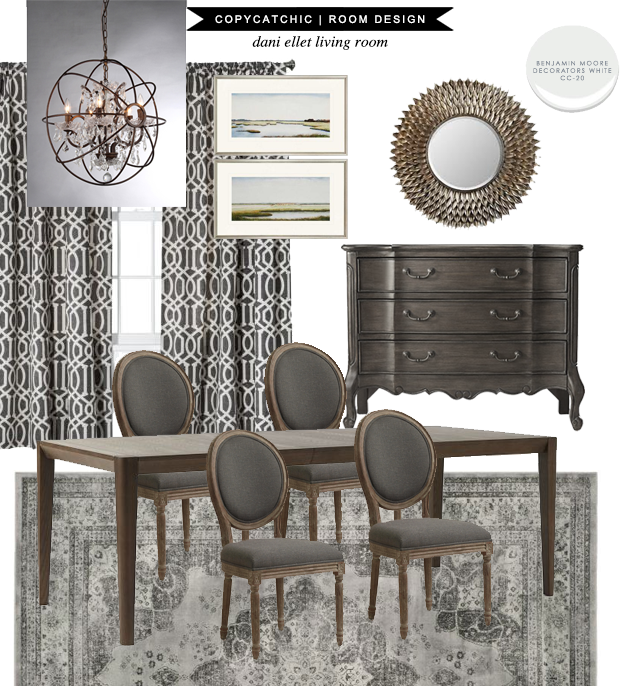 I thought this chandelier would look amazing in the space, but let me know if you'd prefer other options! The wall between the bedroom and bathroom door needs artwork, so I gave you a couple of options there. Also I thought the 55" wall near the kitchen would be a good place to put a small buffet or chest with a mirror for some storage :) A nice rug ties it all in. I can't remember if you said you had paint already chosen or not. If you'd like to keep the wood trim, which is so gorgeous by the way, I think I nice bright white would really help everything else pop. Otherwise if you'd like to paint the trim white, I'd go with a nice gray on the walls. Let me know if you'd like me to choose a gray color. You can definitely reuse the curtains, they look great with the table & chairs. Also the mirror would look perfect in that nook if you choose a short cabinet or chest.